!! OMG, Area 51 realness! Ty Ty posts makeup-less selfie on Instagram !! Take her to you leader! When you’re a supermodel tycoon like Tyra Banks, gags like this are all part of the game! 2 Comments on "OMG, Area 51 realness! 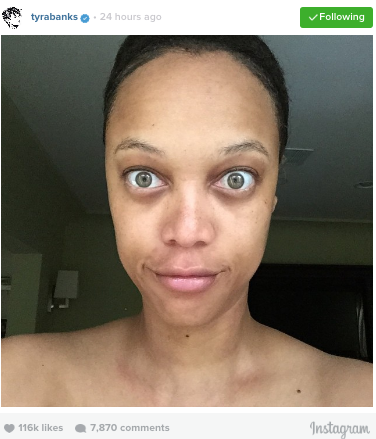 Ty Ty posts makeup-less selfie on Instagram"
I know this is horrible, but she reminds me of Homer Simpson. For real. That’s really bitchy and unfortunate that you would suggest a natural woman without all those caked layers of makeup and photoshop looks like an alien.